"What kind of mutant are we going to find in a place like this?! wonders Scott Summers as he and Jean Grey search the grungy club in Uncanny X-Men #130. Why the kind clad in skintight silver and silhouetted in an awesome lightshow, of course! Dazzler was developed by Marvel in 1979 with the goal of establishing a joint-venture with a record company. Marvel would publish the comics and the record company would produce music along the lines of what Harvey had done with the Archies. 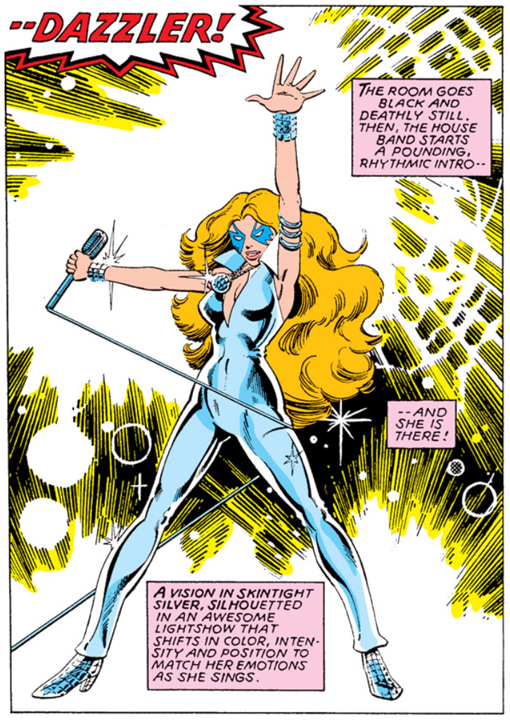 Writer Tom DeFalco and artist John Romita, Jr. were tasked with developing the concept for Marvel and came up with the Disco Dazzler. Romita, Jr.'s designs were originally based on Grace Jones, but the character ultimately became the Alison Blaire that debuted in the X-Men. Marvel's partner in this new endeavor was Neil Bogart of Casablanca Records and Filmworks, who planned both a recording venture and an animated television program to promote Dazzler across multiple media formats. Jim Shooter's account of Dazzler's origins and his film treatment are must-reads for any Dazzler fan or Marvel 1980s aficionado. Comic Book Resources also has an interesting and slightly different take on the story. While the movie and music crossover never panned out, Dazzler appeared as a guest star in a number of other Marvel titles after Uncanny X-Men #130 and the character was launched in March 1981 with a new title for the direct market that broke all prior records with sales of 428,000 copies of the first issue.